The first wild being that I saw was a leopard. Such a majestic creature, a hungry one, too. 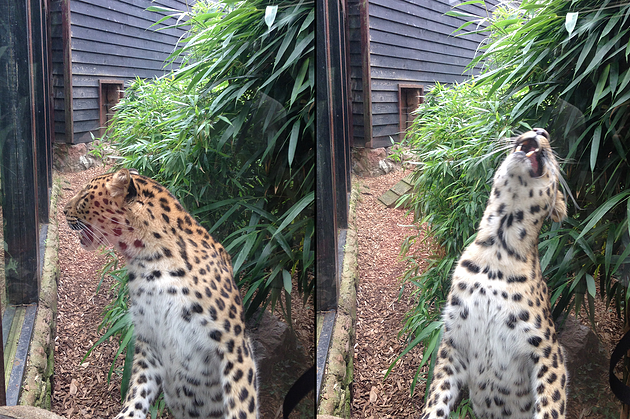 He was pacing around his enclosure eyeing up all the kids as lunch. As mentioned previously, I got to feed an elephant. What a let down - I genuinely believe in a former life I was an elephant, we have a connection like the way it looked at me was like it knew me *admits self to mental institution* I got to feed the elephant a bit of swede and he definitely couldn't have been less greatful - in fact he was that pissed off about it he left a load of snot and a hair on my hand. It was bizarre. Oooooh then I saw a lion, what a dude he was, just chilling on his plinth eating his mean whilst the lady lions paced around him - then he yawned and went to sleep...however, I am always so fascinated with lions, they are just crazy beast animals - I got a pretty good pic of him as you can see! I obviously got to see a crazy amount of animals so I can't list them all and this is just a short roundup of why you MUST go and check out Colchester Zoo. So, finally - possibly the best picture of the day. We decided to go into the kids area where you can roam with goats etc, because we're mature adults. I found out that actually, I don't really like goats and damn did they pester for food. As you can see from the image - goats and me aren't a match made in heaven. If you're ever in the Colchester area I sincerely recommend the zoo, we went for about 4 hours and there was still so much more to see! It doesn't matter if you're old or young, it's a really great Zoo, there is also loads of baby animals which for me is a positive sign that they have a great breeding programme in place. A 5* day out!